Not surprisingly, soup is not the easiest dish to photograph. I mean there's really no way to truly capture how hearty nor how flavorful a soup is in a mere photo, so you'll just have to take my word for it. 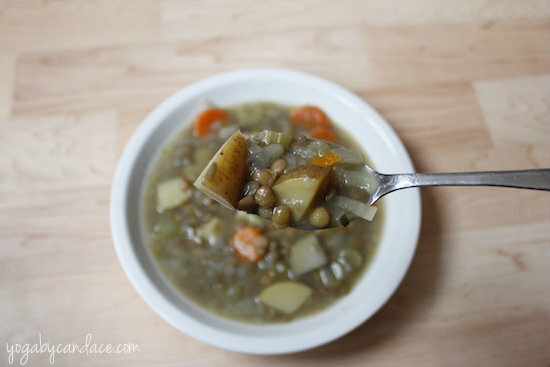 Lentil soup is a winter staple in my house because nothing quite warms you up the same way. Well, except for maybe whiskey or something, but we're trying to keep it healthy around here. 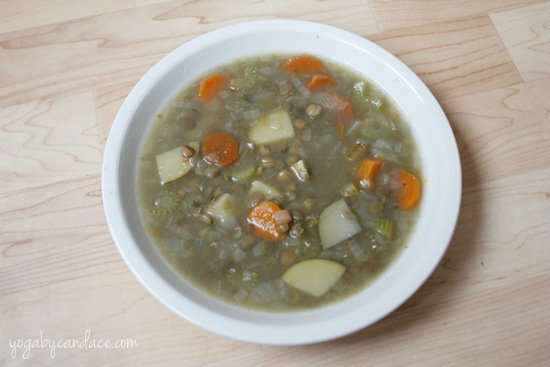 :) Speaking of health, lentils are packed with fiber and protein, low in fat and are easy to digest. Heat your pan. Chop onion and sautee. Chop other veggies while the onions cook until they're clear. Add in water, lentils, potatoes, veggies and bouillon. Bring to a boil and then simmer for about 30 minutes or until the lentils are soft. Eat and enjoy! PS-Granola, vegetarian chili, gooey peanut butter and banana oatmeal breakfast, pesto casserole, Mexican vegetarian dish.